Spice up your campfire tales! Bewitch your audience with creepy creativity! Roll the dice to get your creative juices flowing! Make up stories with your kids at the dinner table! 9 out of 10 zombies prefer Spooky Story Dice over brains! 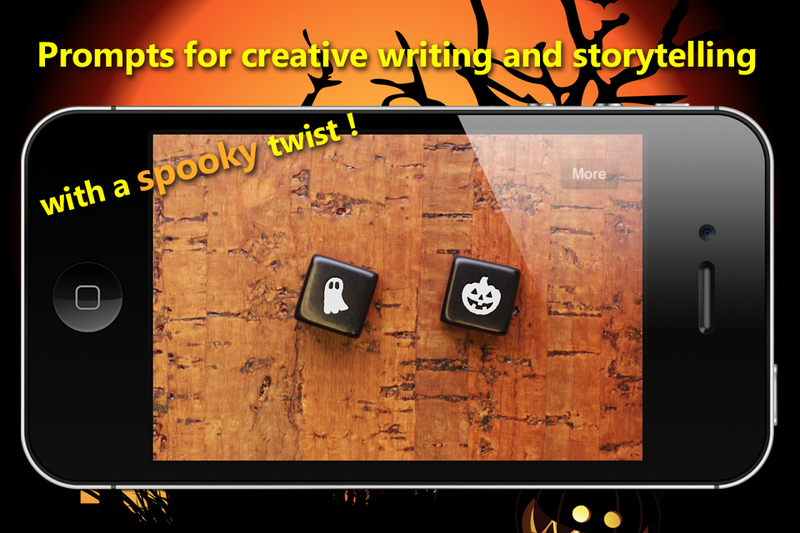 Great for Halloween storytelling and seasonal writing prompts! Choose number of dice to roll, 1-3. Realistic dice sounds and still images. 74 pictograms in dictionary; 23 are unique to this Spooky Edition! Optional game instructions included in app. Our newest app, Story Dice, is now available on the iTunes App Store. Story Dice can be used in a number of ways. It can be a creative writing prompt for writers young and old. It can be used as a pass-around game where players use the dice to extend a collaborative story. The app includes these and more usage ideas for fun and education. There is an Android version coming soon, including support for the Kindle Fire and NOOK devices. To be notified when it is available, sign up for our announcement email list or Like us on Facebook. The update also now supports iOS version 4.0 or higher. Previously only iOS version 4.3 or higher was supported but we heard from several iPhone owners that are still on 4.2 or 4.1. Thank you for your feedback and we’re happy to hear any more suggestions from users!